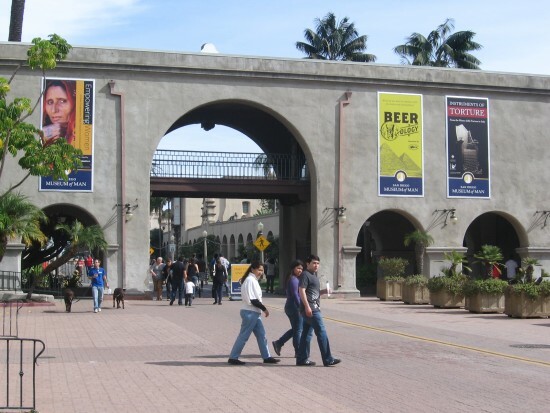 funny – Page 18 – Cool San Diego Sights! A mob of Santas and one green elf. 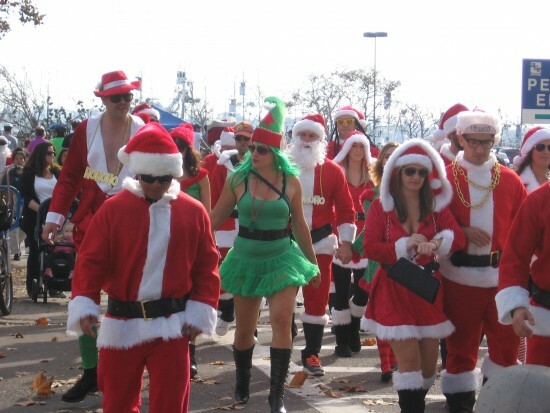 Not sure who all these Santas are, but they were strolling down the Embarcadero and turning heads. Perhaps it’s a new fashion craze. Posted on December 13, 2013 Tags christmas, crazy, embarcadero, fashion, funny, humor, san diego, santa clausLeave a comment on A mob of Santas and one green elf. Surfing Santa arrives by flying a water jetpack! Wow! Santa returned to San Diego in grand fashion! He’s making his big entrance over the bay using a water jetpack! Here he comes! A huge crowd on the pier just north of Seaport Village was watching with excitement this Saturday afternoon! Wait! That’s not just a regular, ordinary, everyday daredevil Santa Claus, but the one and only Seaport Village Surfing Santa! Surfing Santa rises high above the awestruck crowd to wave and wish everyone a Merry Christmas! Where’s his sack of presents? Now he’s just showing off. The jolly old guy is jetting about in a circle like a certified maniac with a ridiculously huge beard. The fish below are probably frightened out of their wits. The first time I saw Santa, I was a bit spooked, too. This happy elf and Mrs. Claus patiently awaited old Saint Nick on the pier with a huge throng of onlookers. The reindeer must be taking the weekend off. Here he is, larger than life! Surfing Santa! He’s boarded the pier and is making his way to Seaport Village to conduct his usual Santa Claus business. After boarding a pedicab sleigh, Surfing Santa parades down the bayside walkway while people munching pizza look on in joy and disbelief. Posted on November 30, 2013 December 24, 2013 Tags christmas, crazy, embarcadero, events, funny, holidays, san diego, san diego bay, santa claus, seaport village5 Comments on Surfing Santa arrives by flying a water jetpack! 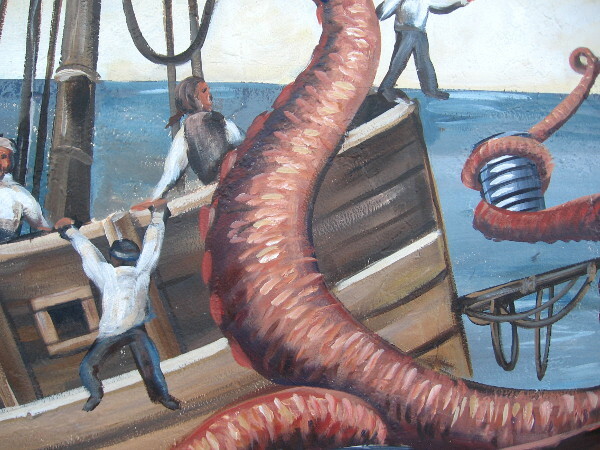 Giant octopus steals tin cans from ship! And now for your entertainment: another terrifying scene! Beware of giant octopi with a taste for canned foods! This wily octopus steals tin cans from helpless, despairing sailors, who then promptly throw themselves into watery oblivion. When you’re in the middle of the ocean in an old ship full of tin cans, what is one to do? This cool mural adds character to the front of a small dive bar on Bankers Hill. The place’s name is Tin Can Alehouse. I’m told they serve beer exclusively in cans. This monstrous octopus really means business! 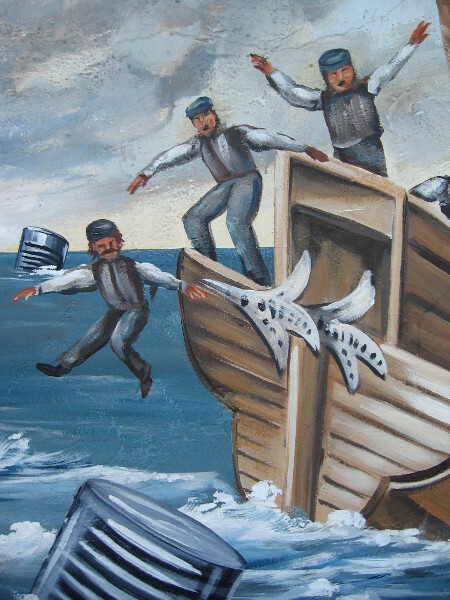 A ship in peril. I guess some sea creatures like their beer in a can. Jump for your lives men! Grab hold of a tin can! 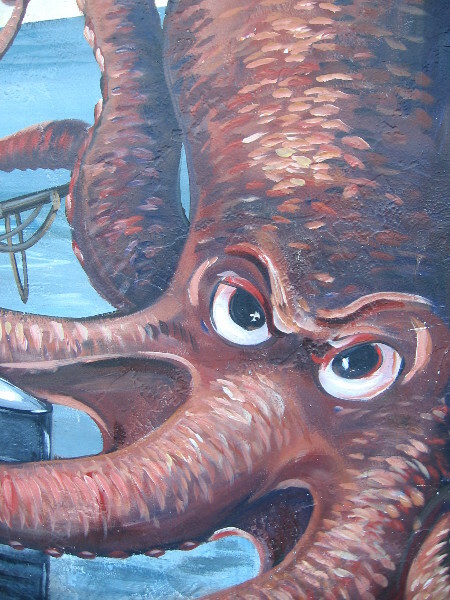 Posted on October 18, 2013 October 3, 2014 Tags art, bankers hill, bars, beer, cool, funny, humor, murals, octopus, sailors, san diego, shipsLeave a comment on Giant octopus steals tin cans from ship! Funny skeleton tries to get a bone tattoo! This morning, as I began to climb Bankers Hill, I casually glanced into this tattoo parlor and was immediately horrified. Just inside the window, a poor skeletal artist was attempting to apply ink to a sadly bony customer. Not much progress was being made. Seriously, I believe this funny window display was created for Halloween! Posted on October 17, 2013 Tags artists, bankers hill, bones, funny, halloween, ink, san diego, skeletons, tattoo parlor, tattoosLeave a comment on Funny skeleton tries to get a bone tattoo! Pig wearing baseball cap is food king. I saw this funny sight and had to take a photo. It’s a sign in the form of a pig. Phil’s BBQ serves barbeque in the Park at the Park during Padres home games. Seems they were winners this year of the Stadium Food King Challenge, a tastiest food contest put on by USA Today. Phil’s tri-tip sandwich beat out the Diamondbacks Sororan Dog, the Brewers pulled pork parfait, and the Royals Cheesy Brisket-acho for top honors. Giant pig with Padres logo and baseball cap seems trapped behind bars at Petco Park! Posted on October 2, 2013 September 12, 2014 Tags advertisements, baseball, food, funny, padres, petco park, san diego, signs, sports, stadiumsLeave a comment on Pig wearing baseball cap is food king. Homeless man sleeps beneath angels. Early this evening, while I walked from work to the trolley station, I spotted this weird but truly wonderful car. I’ve seen it several times in recent months parked in the same area. As I took out my camera, a man with a green parrot on his shoulder emerged from within and gave a friendly hello. He didn’t mind having photos taken. He claimed pictures of his strange vehicle are all over the internet. He explained he was homeless. When I asked his name, he replied Peter Pan, followed by numerous other names, all beginning with the letter P.
He was very glad to show off his unique creation! The roof of the car is topped with numerous bird cages containing angels. The hood features a detailed winter scene with Christmas trees, quaint houses, reindeer and snowmen. On the sides of the car are Christmas ornaments and a variety of snowy scenes from the holiday season, plus images from British literature and classic children’s stories. He pointed out painted pictures of Scrooge and Marley’s office, Mary Poppins with her umbrella, the Baker Street residence of Sherlock Holmes, the Wonkavator from Charlie and the Chocolate Factory, the flying bed from Bedknobs and Broomsticks, and Chitty Chitty Bang Bang. He loved pointing out every detail! He lamented that other homeless people were often mean, tearing off bits of scenery and tossing them over a nearby fence onto the trolley tracks. I asked Peter Pan if decorating his car was done just for fun, or if he had some larger purpose. He indicated it was his hobby. Here’s a close-up pic of the car’s opposite side. The Christmas Imaginarium Carriage appears to be the fantastic vehicle’s name! Posted on September 27, 2013 December 28, 2014 Tags angels, christmas, fantasy, funny, homeless, joy, life, literature, people, weird2 Comments on Homeless man sleeps beneath angels.